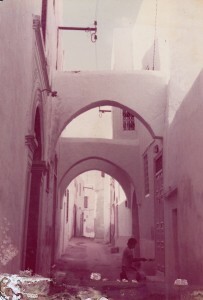 In July 1979 I traveled to Tunisia, to learn Arabic at the Insitut Habib Bourguiba in Tunis. Arrived in Tunis on the 2nd, at about 11 pm (the plane was delayed by three hours). At first glance – at 11.30 at night – Tunis seemed very Mediterranean (or what I conceive of as Mediterranean anyway). There were lots of people on the streets and sitting around in cafés; lots of music, sultry winds etc. Next morning everything seemed somewhat diminished in scale: crowded streets, lots of traffic; people dressed almost universally in jeans, except for the occasional elderly man in a jellaba. Fruit stalls with the wares displayed just as in Calcutta; sweetmeat shops. The pattern of the city is reminiscent of Tehran and Delhi. There’s an old walled city – the Medina – and all around it the new town. The town’s showpiece streets converge on the entrance to the Medina (characteristically, the most important is called the Avenue de France). The showpiece streets are much of a muchness – huge plate-glass windows, hotels etc. Also a cathedral. The part of the city I am living in is very much like New Delhi – it’s a modern middle-class suburb, very much like Vasant Vihar or Hauz Khas. The houses are almost exactly alike, except that when one walks past them the music playing inside is usually French pop. And the folk art on the walls is Saharan rather than Oriya/Gujarati/Rajasthani.